I was born at Atlanta Ga, Sept 7, 1923. 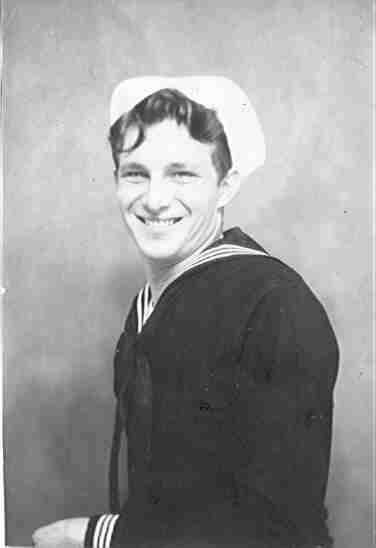 Joined the U.S. Navy August 1941. Boot camp at Norfolk VA, Radioman School at Charlestown SC. Was there when WW-II started. She was sunk at Fadiella North Africa, a small city near Casablanca after unloading troops in 1942. Two other ships were sunk at the same time we got hit. In 1943 I joined the USS Hudson (DD475) still being outfitted at the Charlestown Navy Yard, Boston MA. Met my future wife, Lillian while there. We were married in Malden MA on January 13, 1946 after the war ended. Most of my sea duty was on destroyers. I participated in the Atomic Bomb test, stationed on Kwajaline Islands. *Norfolk VA where I was on the staff of Commander Fifth Naval District. *Was Officer-in-Charge of a Naval Reserve Electronics Facility in Paducah KY for two years. *Keflavic Iceland nearly three years. My wife and two children were with me. *Three years on the staff of Commander US Naval Forces Europe, the family was with me. We really enjoyed this duty, traveled all over Europe. Something we could not afford to do from the states. Communications Center. I was there two years. My last Sea duty assignment was on the Staff of Commander Destroyer Squadron Twelve (The Acey Ducy Squadron), homeported at Newport RI. There were seven ships in the squadron. I decided it was time to retire when we got orders for a Goodwill Cruise to South America. Was tranferred to The Fargo Building, Boston MA for retirement. I retired from U.S. Navy July 1971 as a Senior Chief Radioman after thirty years. Bought my house here in Melrose in 1968. My wife comes from Malden, and naturally she did not want to live in Georgia. We have two children and three grand-children. One living in Medford, MA., the other in Boxford, MA. It is nice being so close and able to enjoy our grandchildren. who publish a monthly on-line publication called the "MELROSE MIRROR". The group meets weekly on Wednesday at 1:30pm at the Milano Senior Center. This project was set up in 1997 by the MIT MEDIA LAB and provides the program, server, equipment and technical support. The program is now in use in several countries worldwide. With help from the members, I learned to write articles and became an editor. This involves spell-checking, formating, inserting html tags, images and links. Since spelling is not one of my best subjects, I leave the spell-checking to the other editors. Everything else I learned to do on my own. Quite a challenge but fun. Without saying anything to the family I began building files for my own Web Site. Finished I told them about it. This did not go over very good. The wife did not want anything said about her nor her photo. The kids felt the same way. I gave up the idea, but still have it on floppies and look at it from time to time. On January 13, 1946 Lil and I got married! On January 13, 1996 Lil and I celebrated out 50th Wedding Anniversary. How she put up with me I dont know, but we survived. Our children, Lucille & Bob, took us to dinner, gave us a few gifts, and a big surprise. A plack notifying us that a two week "Second Honeymoon" had been reserved for us at a Spanish location. All of us would be going. I was against it, I dont like to go anywhere if I can get out of it. As time got closer to the departure date, all of them gave me a hard timeand demanded I go get my pass-port. During all this time, Lil was getting my suit case packed. The heat got really bad, and finally I broke down, got my pass-port. The big day arrived and we were off. Flying over, the Airline gave us a bottle of Champaign, and a free meal. When we arrived at the hotel another free meal, and then taken to our unit. Nice! We settled in, showered, explored the location. A nice swimming pool, small resturant and bar, and to my surprise, some women at the pool were top-less. I began to really enjoy myself, and the family took tours daily. I went on one trip to Morocco and took in a couple of Bull Fights in nearby cities. We all had a nice time and the two weeks flew by. 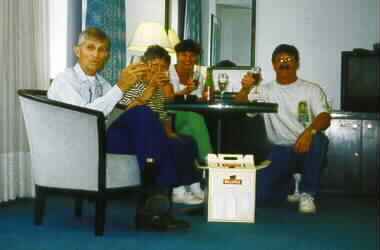 On our return trip, we spent the night in Brussels, where the hotel sent up champaing also. The above picture was taken then. This year (2000) we celebrated our 54th anniversary, and I have agreed to take another trip to celebrate our 75th. 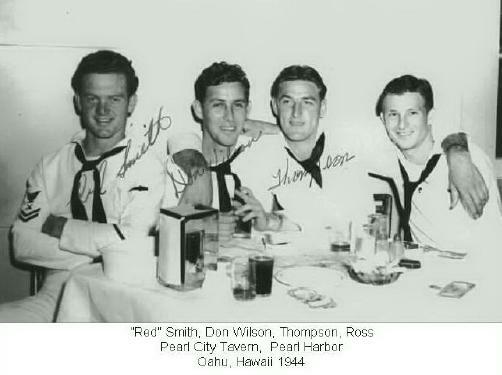 On liberty, having a few at the Pearl City Tavern, Pearl Harbor, Oahu Hawaii in 1944. Soon after this picture was taken we joined the fleet for the Battle for the Pacific. If you care to read about how I became addicted to computers, click below. This article was published in the Melrose Mirror July 7, 2000. Addicted to Computers Click to read it. December 21, 2002. Here I go again. On November 15, 2002 I picked up a new PC I had built. A monster and speed deamon. This is what I got. As if this wasnt enough, ATT BROADBAND was being installed in Melrose. Yep, you gesssed it. 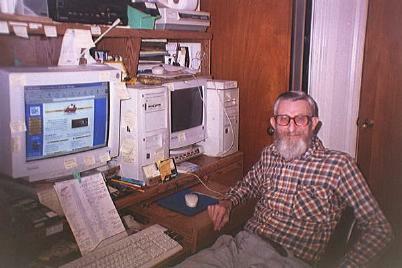 I signed up for TV and Internet... bill went down $4.00 per month/ Installed Dec 4, 2002. Only problem, I have to give up my EROLS/RCN email address and also, which I hate, learn Microspft Internet Explorer(IE). Hope to get NETSCAPE COMMUNICATOR working before I drop the dial-up service with Erols. I love working on my website as no time wasted waiting for pages to load. Everything looks and works different in IE. Only time will tell if I made a mistake. Bought a NETWORK ROUTER and will eventually network the two PC now in use. The OLD one will be for backup and fooling around. I am planning on backing up the websiite files in case they fold or make a bunch of changes like Netscape did in 1998. My Comcast email address is:- bobrsr@comcast.net. Be glad to hear from anyone who wants to write.